Since the release of David Lynch’s gargantuan televised limited event series Twin Peaks: The Return from last year, the cinema and music netherworlds have been buzzing with anticipation for any and all things related to the surrealist master. Between announcing an upcoming Twin Peaks virtual reality project and linking up with the likes of Flying Lotus for his yearly Festival of Disruption concert event, David Lynch and his longtime and most trusted musical collaborator Angelo Badalamenti have been hot commodities in the film, art and music scene. Which makes the news of Lynch and Badalamenti’s thought-to-be long lost Thought Gang musical project resurfacing in a newly remastered vinyl release album via Sacred Bones Records all the more exciting to behold. 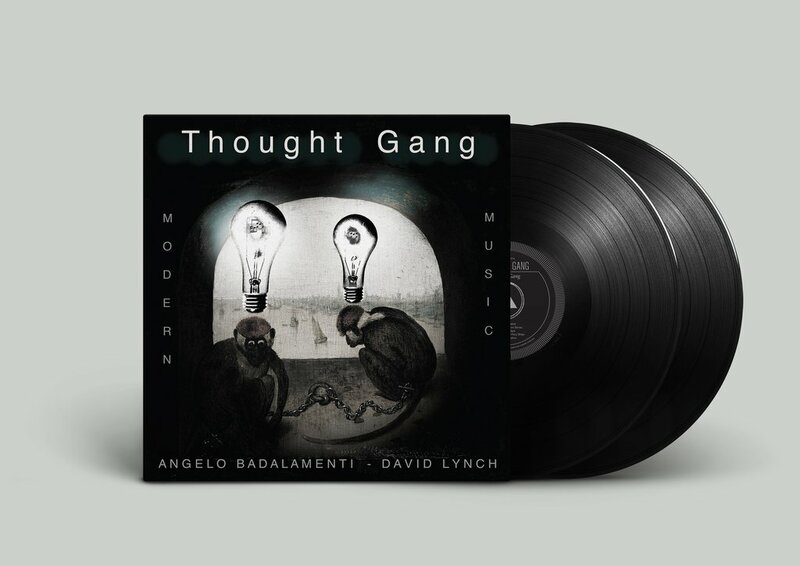 What this Lynch fan wasn’t counting on, however, was just how many different areas the dynamic duo’s music under the Thought Gang moniker found it’s way into. Originally composed between 1992 and 1993 during the heyday of Twin Peaks with the album’s most well-known tracks A Real Indication and The Black Dog Runs at Night finding their way into the feature film prequel Twin Peaks: Fire Walk with Me, this twelve-track album of freeform experimental jazz, sprawling white noise ambience and industrial instrumentation amid Badalamenti’s trademark synth keyboarding represents a rediscovered treasure trove of Lynch/Badalamenti material with more surprises than one initially expects. 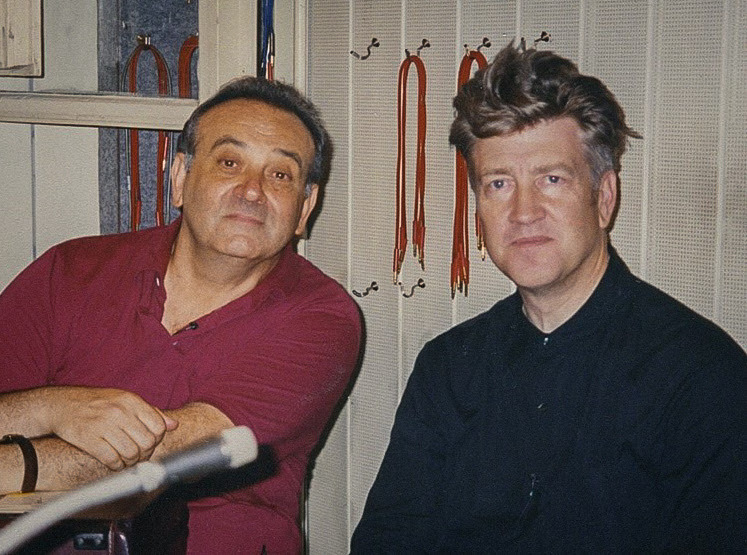 In between purely instrumental tracks of so-called ‘psycho-jazz’ are spoken words voiced by none other than Angelo Badalamenti with some truly strange lyrics akin to Lynch’s own singing in the Inland Empire soundtrack with Ghosts of Love. Standout tracks include One Dog Bark which fans of Mulholland Drive will instantly recognize from the scene where Adam Kesher announces his engagement to Camilla Rhodes as well as Frank 2000 which showed up in the third episode of Twin Peaks: The Return. Unlike the traditional Twin Peaks tracks on the soundtrack albums, the stuff heard here is far more atonal, abrasive, deliberately absurd and far more industrial than most of what you think you’ve heard from these two. 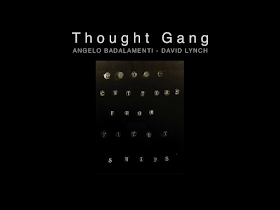 Other tracks sound like they’d feel right at home during the third act of Lynch’s sprawling three-hour opus Inland Empire, particularly A Meaningless Conversation which sounds curiously like Walkin’ on the Sky with Badalamenti babbling ‘num num num num’ over strumming guitars, snare drums and saxophones. 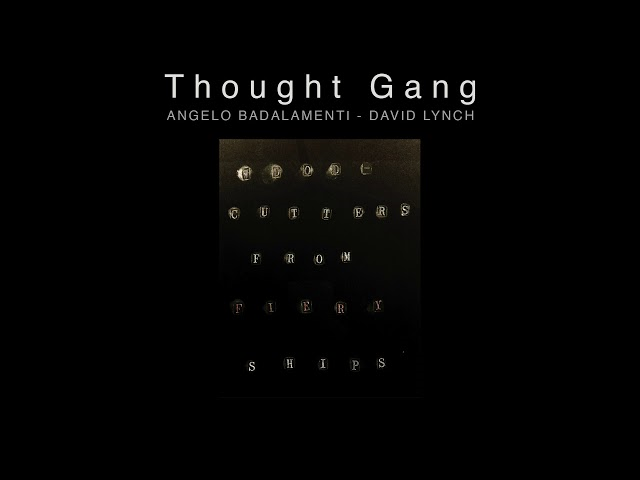 For Lynch fans waiting with baited breath for anything new or old material recently unearthed, Thought Gang is very much a sharp-edged metallic and organic Lincoln Log which instantly connects loose ends left by Twin Peaks, Mulholland Drive and Inland Empire. 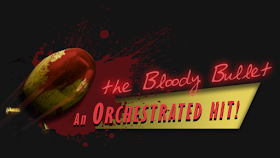 Like most new Lynch offerings, not every burning question people have will be answered by the pieces being included but they do open up far more doors connecting the disparate film properties together in ways both unexpected and foreseen from miles away. All in all, an essential acquisition for any David Lynch and/or Twin Peaks fan’s library!